Monarch Air Group provides private air charter in Telluride, CO. Our clients benefit from top-notch service, unrelenting dedication to safety, wide selection of aircraft, and years of experience in chartering private jets. To obtain a free quote, please use our online quoting tool provided below, or call toll free 1-877-281-3051. Monarch Air Group provides private jet charter flights in and out of Telluride, Colorado. 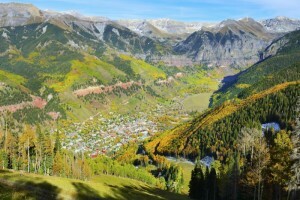 Located in the scenic San Juan Mountains, Telluride is a resort town of southwestern Colorado. Telluride is also the county seat of San Miguel County, filled with modern development, old heritage and picturesque beauty. Once a mining town, it was founded in 1878 and was named as Columbia and later renamed to Telluride. Telluride is located high in the San Juan Mountains, approximately 9,500 feet above sea level in a box canyon and it’s a famous ski town, providing numerous indoor and outdoor activities, lively festivals, special events, fine dining and world-class shopping. The most popular tourist attractions are the Sherdian Opera House, the Michael D.Palm Theatre, and many others. The nearby cities and towns are Norwood, Mountain Village, Ridgway, Ouray, Montrose, Rico, Durango and Cortez, which are worth to stay a night or two. Telluride is served by the Montrose Regional Airport(MTJ), along with the Hopkins Field Airport(AIB), and the Telluride Regional Airport(TEX).